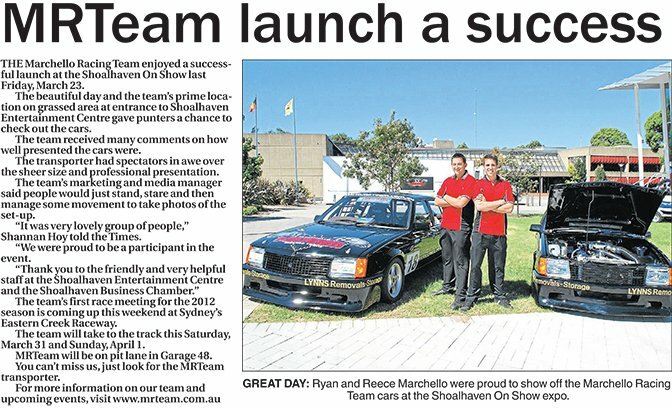 THE Marchello Racing Team enjoyed a successful launch at the Shoalhaven On Show last Friday,March 23. The beautiful day and the team’s prime location on grassed area at entrance to Shoalhaven Entertainment Centre gave punters a chance to check out the cars. The team received many comments on how well presented the cars were. The transporter had spectators in awe over the sheer size and professional presentation. The team’s marketing and media manager said people would just stand, stare and then manage some movement to take photos of the set-up. “It was very lovely group of people,” Shannan Hoy told the Times. “We were proud to be a participant in the event. The team’s first race meeting for the 2012 season is coming up this weekend at Sydney’s Eastern Creek Raceway. The team will take to the track this Saturday, March 31 and Sunday, April 1. MRTeam will be on pit lane in Garage 48. You can’t miss us, just look for the MRTeam transporter.